When you’re a small business owner or even marketer, sometimes anything having to do with the technical aspect of your website can be overwhelming. Many of us may be comfortable curating content and even organizing your website a bit, but when things start getting too technical with terms like “robots.txt” or “301 redirects” many of us may want to find a rock and hide! However, the technical aspect of your website cannot be ignored, especially when it comes to redirects. The last thing you want is for a potential lead to leave your website because it is not functioning properly. Whether you’re cleaning up pages on your site or changing your site, chances are you’ve had to delete posts or pages. While it’s great you’re cleaning up your site, this comes with a risk of a visitor coming across a “404 Not Found” message. These errors come up because you deleted a page without redirecting that page to another. 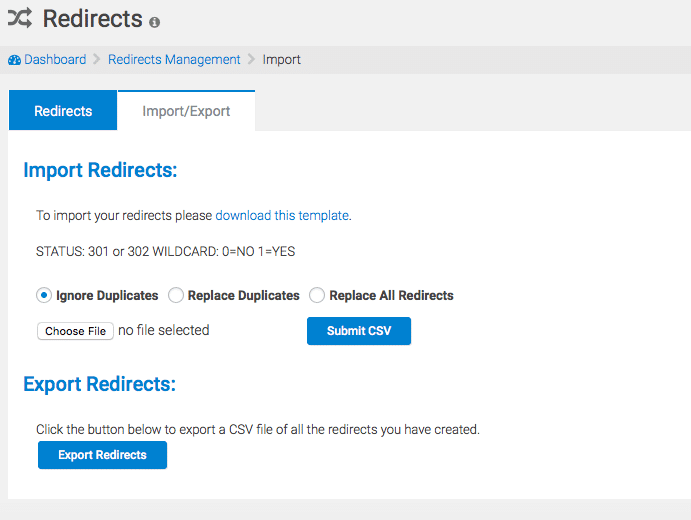 To solve this problem, you need to be sure and set up 301 and 302 redirects. While this may sound complicated, we promise— It’s a cinch to add and import links to redirect the old URL to a new URL… No coding required.